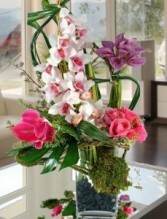 Gym Bicolor Pink Orchids, Purple Mini Calla, Pink Mini Calla, Pink Roses, Bunched Bear Grass, Seeded Euc, Moss, Curly Willow Twigs, Tropical Leaves. Everything exceptional! 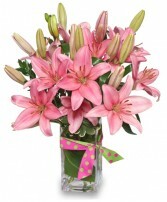 Bi-Color Pink Orchids, Purple & Pink Calla lily's, Pink Roses and lots of extra pizzazz. 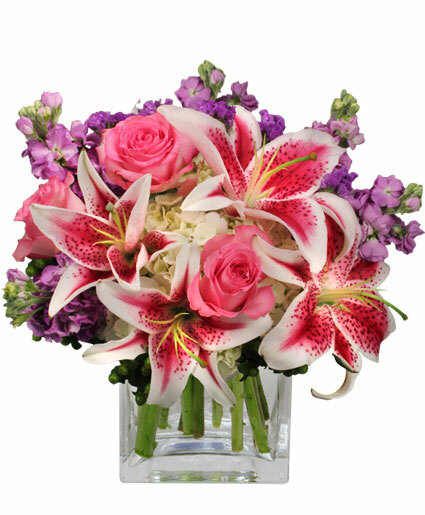 A TRUE GEM OF GREEN ORCHIDS AND HYDRANGEA "LAVISH COLLECTION MUST BE PRE-ORDERED 3 DAYS IN ADVANCE"
Green Orchid, White Hydrangea, Tulip Or Sub, Snap Or Sub, Tropical Greens, Vase. This Gem will complete her day! 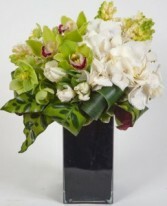 Green orchids, white hydrangea, with other stunning accents.